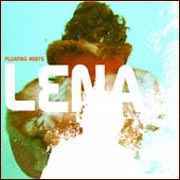 FLOATING ROOTS, Lena's second album, takes a more melodic approach to dub that his previous. But for those who prefer the minimalist dub, fear not: "Under False Rulers" and "Smoke Screen" keep that spirit alive. For me, though, I like the delicacy and tenderness of "Wax Model," the icy deepness of "Casquette of Sound," or the steady stream of "Mountain Dub." The title track introduces some light flutes to toot along the surface of a dream. But Lena also touches on some funk, with "Storm Blowin" (featuring Black Sifichi's rollicking spoken word) or "Wah Gwan?" The roots might be floating, but they're still solid.